Many among us have the issue of going late to bed but again getting back to work early. Or getting up abruptly in the middle of night and later on struggle to complete our sleep. This in turn leads to sleep deprivation and poor quality of sleep that ultimately affects our daily work. We have all experienced such situations at least once in our career. What’s The Reason For Sleep Deprivation? However, one important reason we could site is the normal traditional mattresses that we sleep on. Keeping these issues in mind, Gel memory foam mattresses are specifically designed to offer the ultimate comfort levels that help you get quality sleep even when you get a chance to sleep for only few hours a day. And What’s The Best To Try As A First Time Mattress Buyer? If you have a hunch in your mind whether these seriously work as promised or not then I suggest you to try DynastyMattress. Let me give you the reason why you should try this one. Firstly, the Dynasty mattress comes with 120 trial period, 30 Year Warranty and 2 gel pillows for FREE. 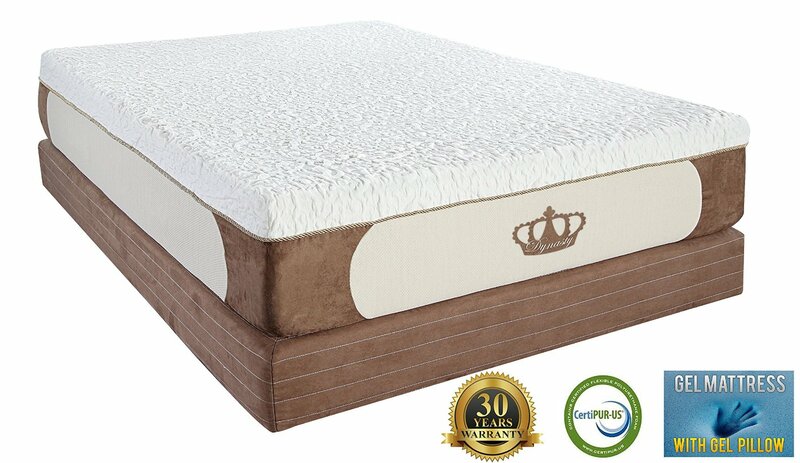 It is a 3 layered 12 inch mattress and is both economical and offers THE BEST QUALITY as per hundreds of user reviews in addition to our experts review. What About Mattress Company Background? Basically, Dynasty is famous for offering best quality mattresses at affordable prices unlike other companies that offer the same features but a much higher price. And this is what makes it the best seller in mattresses category. How About The Mattress Construction, Number Of Layers And Their Firmness? The construction is as depicted in the below image. 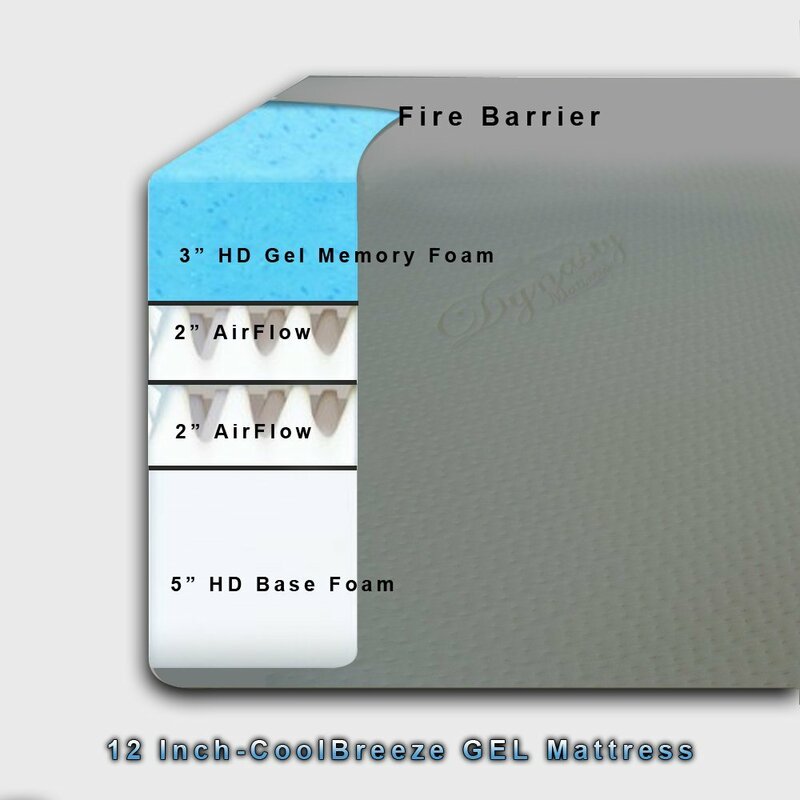 3 inch HD gel memory foam: The Sleep Cool Technology in this 3-inch top layer offers the much needed cooling effect. The problem with traditional foam mattress is that they do not absorb mattress heat and also sink in a lot without offering any support leading to sagging and back pain. However, gel mattresses are infused with gel bead that offer perfect firmness at pressure points around waist and upper body. Additionally, these gel beads provide the ultimate cooling effect helping you get perfect quality overnight sleep. Next are the two state of the art, 2 inch cool air flow foam layers. When we sleep our body generates heat and an ideal mattress has to absorb this heat. Otherwise, it might result in excessive sweating and irritation affecting our sleep. These two air flow layers perfectly regulate air flow across the mattress and help maintain coolness throughout the night. While the top layers offer the ultimate cooling effect and air flow plus heat absorption, the bottom layer is made from high density foam that’s designed to provide the required level of base support. This layer is 5 inch thick HD Foam that perfectly balances your body weight especially around waist and shoulders. These are the pressure points and if your mattress sinks at these places, then it might most probably result in back aches and shoulder pains. All these three layers are capsulated within a fire barrier cover that’s white on top and brown on the sides. And of course, this is zipper cover that is easily removable and washable. Yes, additionally the company right now is offering two pillows worth $100 absolutely FREE OF COST along with the mattress. Well, the construction part is not yet over unless we talk about the quality of the materials and its certifications. Yes, we really need to talk whether the mattress meets industry specifications as it really comes at a competitive price plus is offering free pillows worth $100. Yes, like most other premium mattresses in the market, Dynasty Mattress is CertiPUR-US® certified assuring you of the best quality and durable material. CertiPUR-US® is a certification program specially designed to ensure that the foams used in making a mattress are low on VOCs, free from CFCs and PBDE flame retardants, making them non-toxic and non-hazardous to our health. If a mattress is CertiPUR-US® then be assured that it is made from best of materials.